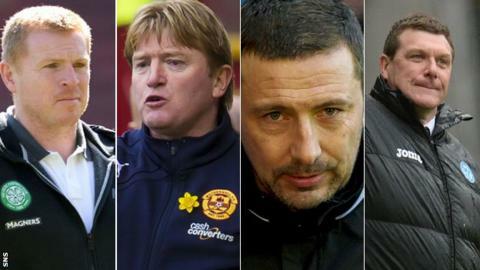 Celtic's Neil Lennon, Stuart McCall of Motherwell, Aberdeen's Derek McInnes and St Johnstone's Tommy Wright are vying to be PFA Scotland's top manager. Lennon wrapped up the Premiership title with seven games to spare. McCall has guided Motherwell to third place in the table and is seeking a third successive European spot. McInnes won the League Cup and has taken the Dons second in the league, while Wright has taken the Saints to their first Scottish Cup final. Announcing the shortlist, Scotland manager Gordon Strachan did not wish to be drawn on who he had voted for ahead of the winner being announced at a ceremony in Glasgow on Sunday. "It is a toss up - and there's friends of mine in there and I don't want to upset anybody," he said. "They have brought entertainment to Scottish football and it's not just their own clubs - they've developed Scottish football this season. "If we get teams like Hibs, Hearts, Rangers back playing at the top of their level, it would be a right good league again." With four games remaining, Lennon's Celtic have lost only once on their way to a third consecutive league success. "Neil, he's won the league and he's got a record number of points," said Strachan, who was twice manager of the year during his time at Celtic. "It's not easy to keep a team going, keep their concentration, keep their application right when it looks like it's easy when it's not. "They have made the league look like it was easy with their application and their team spirit." Celtic's solitary league defeat came at Pittodrie against Aberdeen, who are three points clear in second place. McInnes, in his first full season at the helm, ended the Dons' 19-year silverware drought with a penalty shoot-out League Cup final triumph over Inverness Caledonian Thistle in March. He also steered them to the last four in the Scottish Cup, beating holders Celtic along the way. "I think, with his coaching staff and his players, they have brought Aberdeen alive again," said former Dons midfielder Strachan. "I was here for the Scottish Cup semi-final in Glasgow and, in the morning, the place was full of Aberdeen fans. The stadium was full and it was fantastic. "I went to see them in the League Cup semi-final at Tynecastle and the atmosphere was unbelievable. "Not only has Derek done a great job for Aberdeen, he's done a great job for Scottish football in that he's actually filling stadiums with Aberdeen fans. "The fact that they've won a trophy is absolutely fantastic after a few years of not winning anything." St Johnstone were the team to topple Aberdeen in the Scottish Cup semi-final and Wright has enjoyed a great debut season in charge, securing a third consecutive top-six finish for the Perth club. Now Saints have the chance to lift their first piece of major silverware when they take on Dundee United at Celtic Park on 17 May. "He got off to a great start to the season," said Strachan. "Everybody sat up when they beat Rosenborg because we always know how difficult it is to play a Scandinavian side at that time of the year when they've played so many games. "He's went on and the team have developed as individuals and as a group. I think they've done fantastically well." Motherwell, who finished as league runners-up last year, are just two points shy of last term's points tally under McCall, who is Strachan's assistant at international level. "I've got to say I was a bit worried about him, not his general health because he's getting a bit heavier, the fact that he lost five right good players during the summer," added Strachan. "If you lose four or five good players through injury during a season then you are liable to have a real problem. "The fact he has lost these players and replaced them without spending any money, it is quite phenomenal to be third in the league and still with a chance of being second."